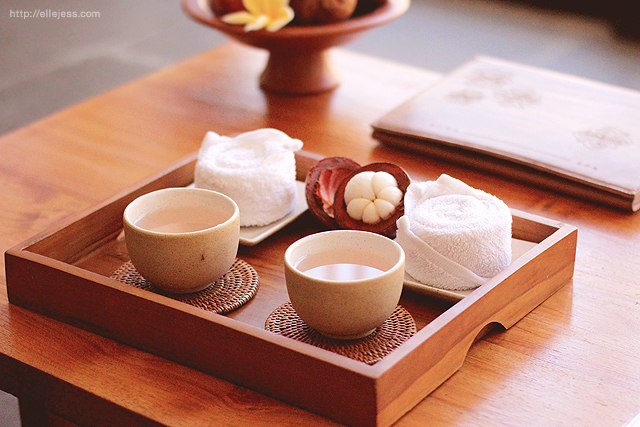 When we first got an invitation from Fontana Hotel Bali, we were charmed enough by their website. But when we really got there, boy it was like entering a postcard. Welcome drink by the pool! 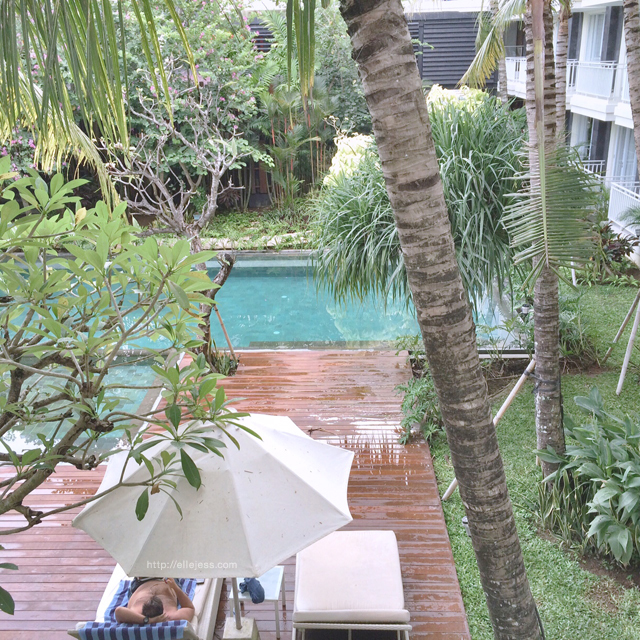 Located in Kuta, one can absolutely say that this affordable four-star hotel is like a hidden oasis in this euphoric area. Just the perfect place to relax and unwind after such a weary journey. Okay, are you seeing what we’re seeing…? DAMN RIGHT BABY! 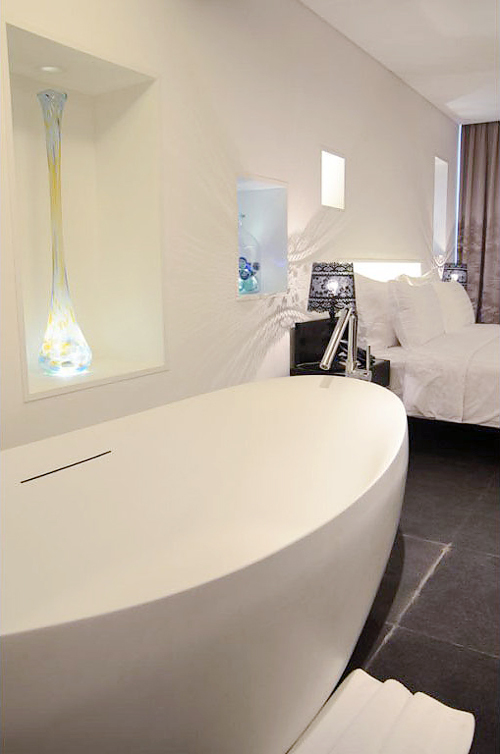 An in-room bathtub!! Noyceee. WE ALSO WANT a TV that tilts to our bed in our own bedroom!! Preferably one that tilts and shut down automatically when we fall asleep after watching FRIENDS or Game of Thrones. Ok wishlisted! Lunch at Portabella was one of the nicest lunches we ever had! Hats off to Chef Vittorio Negri, the 2nd Winner of HELLO BALI’s Chef War who was directly ‘imported’ from Naples, Italy to stay at this beautiful, warm Italian bistro, cooking these exquisite delicacies for us. White dinner roll, extra virgin olive oil, balsamic vinegar, cauliflower cream and vegetarian lasagna. 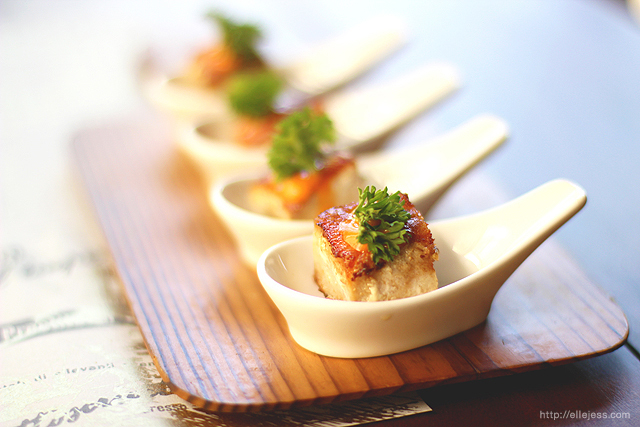 Portabella serves different creations of amuse bouche everyday. It’s a complimentary and not listed in the menu. We love the vegetarian lasagna – the ones on the spoon so much! Crabmeat, leeks, dill-flavored oil. Although the aroma was not so strong, the soup’s texture was rich and the meat filling was generous. Spiced seared tuna loin rare with black olives tapenade and caponata. This was extra, extra delicious. The fillet was very fresh and nicely done, the complementing vegetables and toppings made the whole combination perfectly scrumptious. Handmade tagliatelle pasta in light cherry tomato sauce and lobster fillet. The best part of this delicious meal is that the meat was already removed and cut into small, yummy chunks, spread all over the aromatic pasta. The left one is Orange and Peach. It was *obviously* made of fresh orange and peach, combined with yoghurt, milk and honey. The Tri Berry Smoothies was a healthy pack of strawberry, raspberry and blueberry whipped with yoghurt and fresh mint. Both drinks were served in tall tumbler glasses. They’re kinda heavy for those who prefer mineral water or iced tea to accompany their lunch, but they surely were yummy and refreshing! The next day, we were greeted by the glorious. hotel. breakfast. 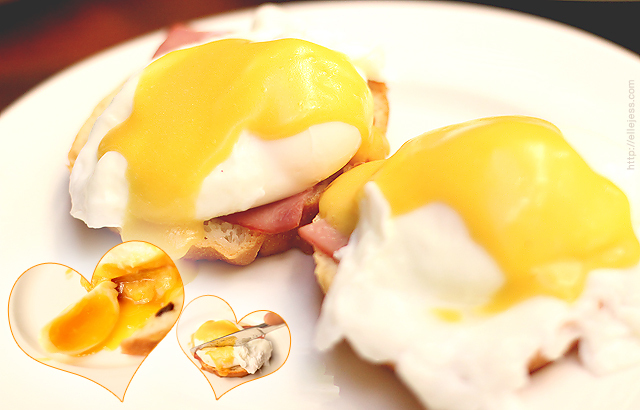 Egg Benedict with Ham and Toast | Runny eggs are the best!! No, seriously. The breakfast buffet outrightly exceeded our expectation because they had so many to offer, like this selection of pastries, for example! Honey Glazed Cup O Cappuccino, anyone? Being there at Hari Raya Nyepi (Balinese traditional event “Day of Silence”) where everyone, including tourists are not allowed to go outside, the hotel offered some special programs that guests can enjoy like: Movie Shows, Discounted Spa Packages, Cooking Class, Making Canang (Balinese Origami Class) and Traditional Balinese Dance Class. Just take pictures with it lah hahaha! Daisy Flower Print Shirt Yellow & Lil Flowers Elastic Cuffed Denim Shorts by GOWIGASA…that opens right up to THIS! This way to heaven, Sir. The refreshing welcome drinks + cold pressed towels to aid the hot, hot day! We both *telepathically* picked the radiance scrub and passionate massage oil lol! Excuse the drowsy, ready-for-spa face. The spa began with us taking off our clothes, wearing only provided disposable underwear instead. After lying down, our backs were covered with a sheet. The masseuses rang a bell and thus begin our treatment. First step was body scrub, followed with towel cleansing and feet-body-head massage. Our masseuses were experienced and the massage was great. Unfortunately, it was too fast to us (we’re used to 5-6 hours spa packages whenever we’re in Bali). 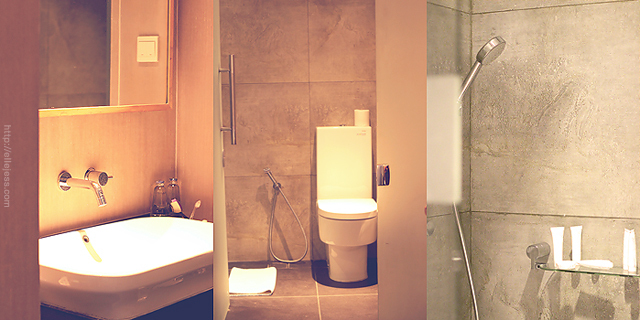 After the massage is over, the masseuses left the room so we can take a bath or a shower. Got invited to a special lunch with Chef Vitto and the general manager of the hotel. 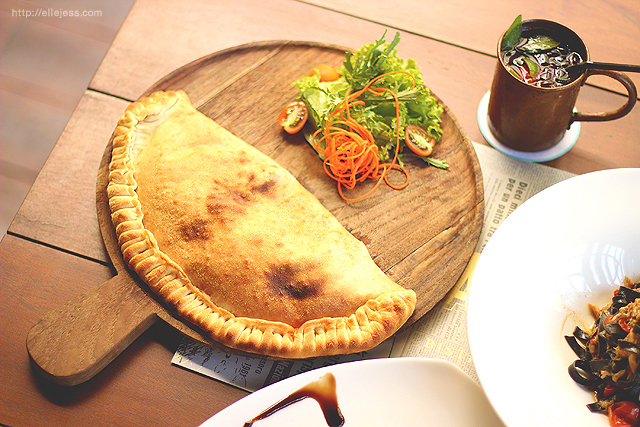 This time, the lunch took place at Portabella’s terrace; which has more minimalist, urban feel than the first floor. 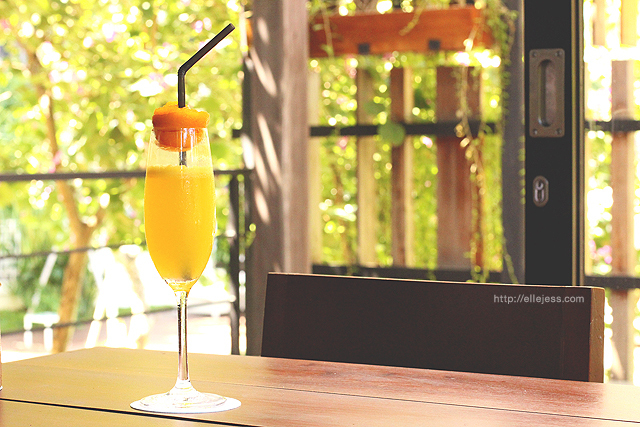 Complementing the hot afternoon, lunch started with the serving of these fresh cocktails. 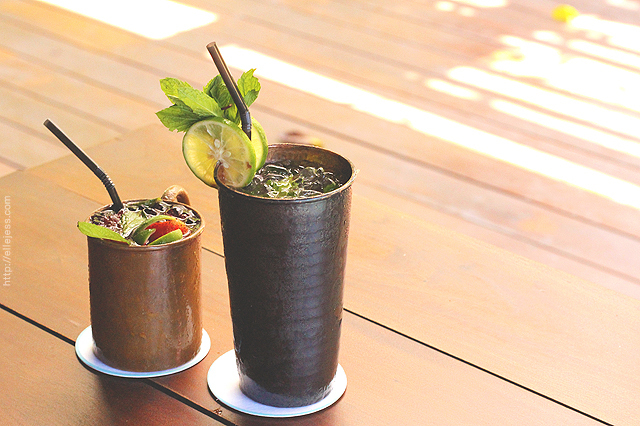 Served in a classic copper mug, the Berry Merry Mule (the left one) consists of gin, lime wedges, mint leaf and topped with ginger ale. And on the right side, we have Coconut Mojito which consist of white rum and coconut liqueur, combined with fresh mint and lime. 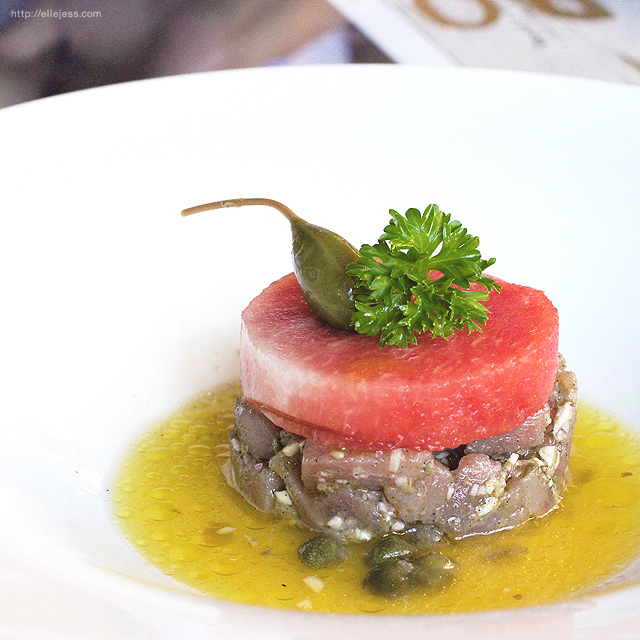 Raw tuna chunks dressed with lemon garlic, topped with watermelon, served in orange and capers soup resulted in this amazing, refreshing treat! The fresh tuna and watermelon created a surprisingly delish combination. 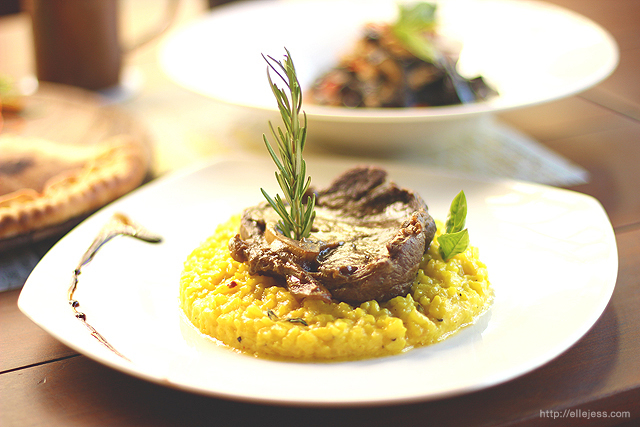 Cooked in Milanese style and served with saffron risotto resulted in this fragrant, satisfying meal. The juicy veal shank was also very tender and superb due to the three hours cooking process! 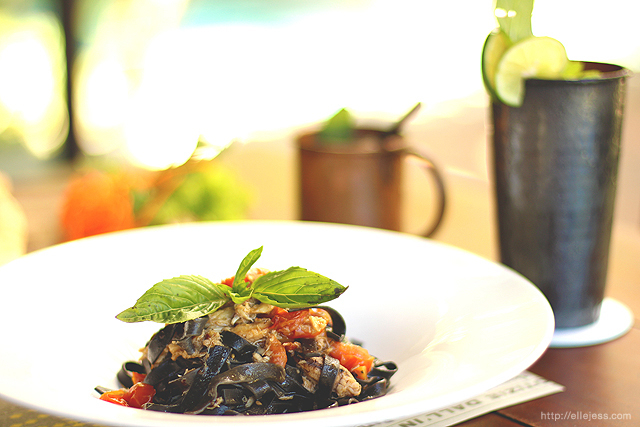 The Sicilian style house made linguine pasta was cooked with squid ink to color it black. To make it whole, it was topped with Borneo crab meat and cherry tomato sauce. Now this one was actually a…….. PIZZA!!! We know, right!?? The topping becomes the ‘inning’ for this unique Italian dish! Peppered with tomato, mozzarella, ham, black olives, salami and mushrooms, it was actually a deep fried or oven baked stuffed pizza. 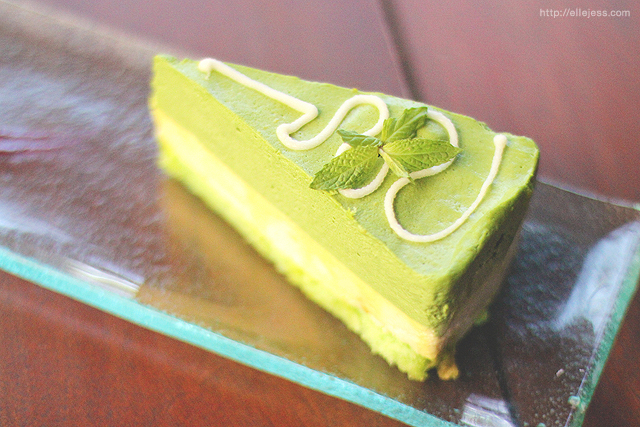 Layered with white chocolate mousse, this green tea ganache was so soft and fragrant. 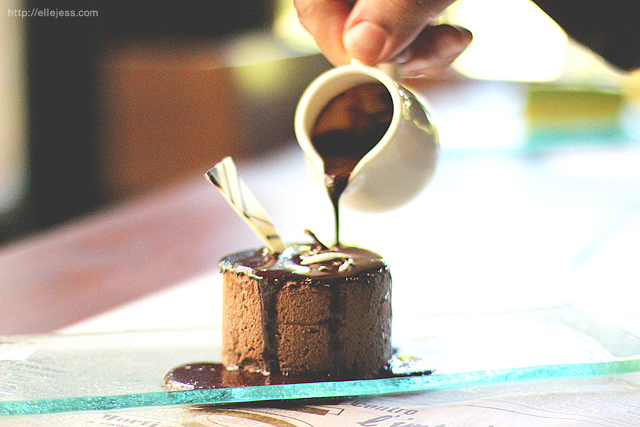 This ‘light’ dessert was said to be the ladies’ favorite. 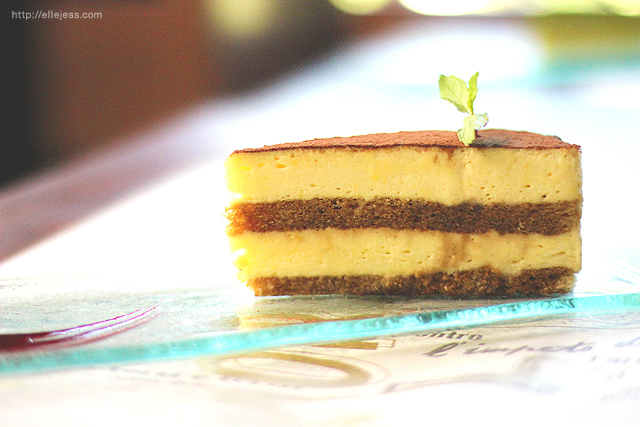 A classic Italian recipe with mascarpone cheese. This one was good but not so different with any other Tiramisu we ever had. Okay words cannot describe how sinfully delicious this bittersweet dessert was. Thank you so much Chef Vitto for sealing our last day in Bali with these well-prepared amazing treats!! I know Elle's strawberry dress! It's from Henry Holland for Debenhams wasn't it? What size are you wearing Elle?